Glue dots are a staple in my craft room. I use these to adhere just about any small item on paper crafts, school projects, kids crafts (very easy for the kids to use, too!) They come in permanent or removable and I love how you can buy them in many different sizes! This stuff is super strong and is my go to when it comes to things with metal (jewelry, barrettes, metal embellishments, etc.) It’s washable and waterproof. Who hasn’t super glued their fingers together or to a craft they were making? This is tough and I the thing I love most about super glue is that it dries lightning fast and you don’t have to clamp your crafts together. Also is great if you have a deep cut and no bandaid around! My children are the reasons I have glue sticks in the house! However, I use them for repositioning things quite a bit or if I’m doing a photo shoot and something isn’t staying in place I put a little swipe of glue. Works like a charm! They are acid free and photo safe, too. The reason I stuck (no pun intended) this baby on the list is because you can do amazing things with it. Our number one post on UCreate is the watermark tee tutorial and you use this blue gel glue…go check it out! Okay, really what can’t you do with Mod Podge right? My favorite thing about it is the way it seals and protects my projects. Over the years Mod Podge has come a long way. You can buy it in all sorts of finishes, you can use it on all sorts of mediums, and it’s a cinch to use! Sometimes I have intricate projects where I need to be specific about where I place the glue and this handy tool is perfect for that. It’s not messy and it’s safe for photos and acid free. This one is self-explanatory and when I don’t feel like getting the sewing machine out, I’ll often grab this glue to fix something that has come unstitched or I also like to use it and turn small projects into no-sew projects. This stuff has been around forever hasn’t it? I remember my mom using this all of the time when I was a little girl. You know how kids use white school glue for everything? Well, I like to think of this as my “big girl” school glue. It dries clean, it has a strong hold, and it’s my all-purpose go to glue! Gorilla wood glue is always next to me when I’m doing home decor projects like frames, decorative molding on my crafts, putting together shelves, basically whenever I’m creating with “wooden” projects. I like foam tape for a couple of reasons. I cut it up in small pieces and use it on my small crafts to give it that pop or 3D dimension. I also love it when I’m doing poster displays for my church or kids’ school projects! When I’m making cards or scrapbooking this is my go-to adhesive. They come in many different sizes, brands, and you can also buy removable and permanent versions. Hello? Duct tape crafts galore! Over the past two years you can find just about any pattern your heart desires! My very thing about spray adhesive is how quickly you can glue a large area. This works so great on large projects, but make sure to use it in a well ventilated area! I really don’t know where to begin on this one. I use it all of the time. This is probably my “most-used” adhesive. I use it for flower arrangements, ribbons, wreaths, hair crafts, you name it! This just makes things look pretty. It’s easily removable and is probably the most decorative adhesive out there! You won’t believe all of the different things you can do with washi tape. Check out this Washi Tape Tutorial List! I use this tape when I’m gift-wrapping, doing school projects (it’s really easy for the kid’s to use), invitations, and many other paper crafts! 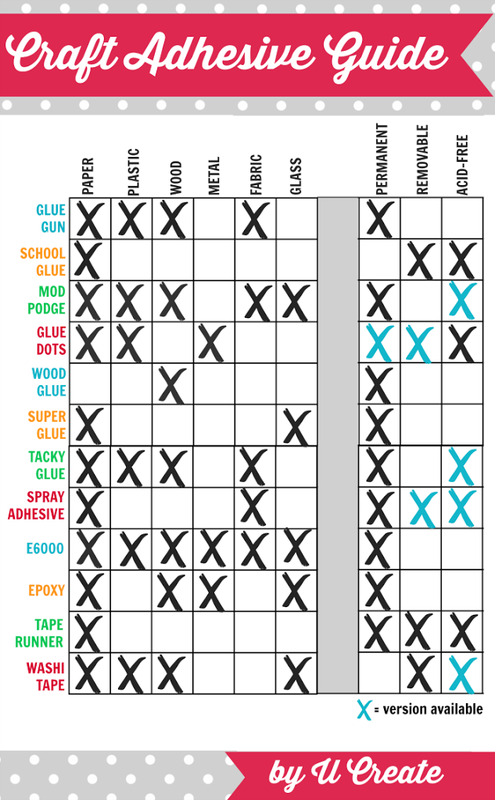 I’m a visual person, and I wanted to share an easy guide graphic that might explain what these adhesives do more easily! Also, I’m sure I missed some adhesive tips in this post so if you have any advice on this subject please feel free to share in the comments below! THANK YOU so much for this. Such a huge help. I am mainly a scrapbooker but really appreciate all of this information as I venture into more crafts and what STICKS best. You’re welcome! So many adhesives out there and they can be confusing! I would add that hot glue from glue gets doesn’t do well in cold environments, it just gives up its adhesive power. So indoors or warm weather only! I like Elmer’s Pro Bond for gluing broken resin figurines, decor pieces, etc. Works great on many other surfaces, too! I started using my E6000 glue for most of my crafts now. . That is some strong stuff. FABRIC ADHESIVE TAPE!!!! It’s the most incredible invention! I made temporary curtains for my beach house and it was vertically impossible to tell that they were not seen! How haven’t I tried this? Thanks for the tip! Hi Kari, I have crazy flower design project coming up and I need some help. So, what kind of glue can I use on glass/mirror to at attach pvc pipe, perpendicular, and clear plastic tubing? I’ll experiment but thought you might have some insight. You would definitely need a super strong glue, and I hesitate to give advice on a project like this because I haven’t really glued PVC pipe. Please let me know what you find out and the project you are working on sounds fabulous! Pls what type of glue I can use to glue stones,crystals on a !metal surface?